In a large skillet, heat oil. Add onions, celery, and garlic and cook until they are translucent but not browned—approximately 5-6 minutes. Remove to a clean dish. In the same skillet, add the ground beef and cook until browned. Using a large spoon, discard any excess fat/grease. Add the onions, celery, and garlic mixture back to skillet and stir well. Add the worcestershire sauce, thyme and cook for an additional minute. Add frozen vegetables and gravy and cook for an additional 2-3 minutes. Season with salt and pepper. Cover a large casserole dish with cooking spray. Pour the ground beef/vegetable mixture into the dish and spread evenly. Spoon the mashed potatoes on top and carefully spread to create an even layer. Sprinkle parmesan cheese all over the top and place the dish in the preheated oven. Bake for 25-30 minutes. 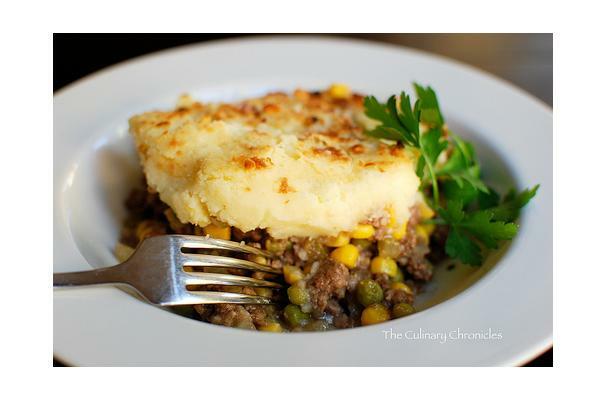 Turn the oven broiler on and brown the top of the Shepherd’s Pie until it turns an even golden brown color. Remove from the oven and allow to set for 5-10 minutes before serving. Enjoy!